The Smurfs Amazing Adventures contains eight episodes, spread over two DVDs, from the '80s Hanna-Barbera Productions animated TV show. This collection seems to be weighted more towards the show's later years, when new characters were introduced to keep things fresh. In fact, Gargamel hardly appears here at all. The Scarlet Croaker - Whilst searching the Creepeedeepee Swamp for delicious Swamp Root, the Smurfs are kidnapped by the hideous Wartmongers. But someone mysterious comes to their rescue. Grandpa’s Nemesis - Grandpa’s ancient enemy, the evil warlock Nemesis, comes in search of Grandpa and the Smurfs’ Long Life Stone. Will Grandpa be able to save the stone and himself from the powerful enchanter? Land Of Lost and Found - Evil Scour steals Papa Smurf’s telescope. When Hefty, Handy and Brainy try to retrieve it, Scour takes their most valuable possessions – handiness, heftiness and braininess. 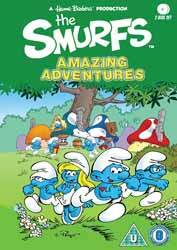 The three Smurfs must travel to the land and bring back the telescope, as well as their lost abilities. Marco Smurf and The Pepper Pirates - With the help of Marina the Mermaid and a dolphin, the Smurfs set sail to save Marco Smurf, who has been captured by Captain Pepper. Lots of sneezing ensues! Kow-Tow, We Won’t Bow - When Smurfette and the Smurflings chase Puppy in to the land of the Wartmongers, they get captured in bubbles and imprisoned by King Bullrush. Can the rebels rescue them? Never Smurf Off Till Tomorrow - A hurricane carries the Smurfs’ windmill away in to the crater of a volcano with six smurfs inside! Lazy is blamed for putting the Smurfs in this dangerous situation. They are all going to have to Smurf together to save themselves. Will Lazy Smurf be forgiven? Smurfs At Sea - Papa Smurf recalls Dreamy’s exciting voyage on the high seas and his gripping adventures with sea turtles, whales.... and pirates! Sideshow Smurfs - Clumsy and Smurfette are captured by the wicked Bombast, who plans to exhibit them in his sideshow. Papa Smurf hurries to their rescue, with the unlikely help of Gargamel! In the past I've reviewed every season of The Smurfs and while I did actually remember the majority of these episodes, the surprising thing is that two of the most annoying episodes are included here. I pity any parent who has to sit through The Scarlet Croaker and Marco Smurf and The Pepper Pirates more than once. It's not the stories that are annoying, but both have characters who repeat annoying phrases. In The Scarlet Croaker, the Scarlet Croaker manages to say "Croak Oh, Croak Oh" just enough times to get under your skin. And Marco Smurf and in The Pepper Pirates, the pirates have an annoying song that they insist on singing at every opportunity. If you want to keep your little ones happy then this collection will do the trick... Just make sure you're wearing ear plugs if you're in the same room.